What is 'economism'? 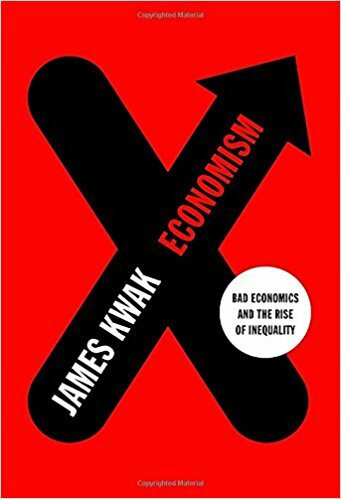 James Kwak describes it as "the belief that a few isolated Economics 101 lessons accurately describe the real world". What he has in mind are the pernicious effects of the perfectly competitive model, illustrated by the supply and demand curves familiar to every introductory economics student. The simple model that is at the heart of the textbooks portrays an economy in which resources are allocated efficiently. Firms produce products at the lowest possible cost; consumers maximize utility. There are no free lunches: no one can be made better off without making at least one other person worse off. All well-meaning attempts to improve the outcome with taxes or regulations produce 'deadweight losses' and inefficiencies. Any proper introductory text contains lots of material which, if read carefully, contradicts this simplistic story. But, as we argue in our Anti-Textbook, it is still all too easy to come away from an introductory course a believer in economism (although we didn't use that word). Most of the population is untainted by exposure to introductory microeconomics courses, but the arguments of economism are everywhere. They are "generated by politically motivated think tanks, amplified by the media, repeated by lobbyists, and adopted by politicians". The primary targets of this propaganda are likely the relatively well-off and politically active part of the population. In the case of the United States, the central policy prescriptions of economism do not seem to be accepted by the majority of the population. For example, Page et al. (2013) show that there are systematic differences in opinions about public policy between those in top income groups and the general population. In turn, actual policy reflects the preferences of those with high incomes, not the preferences of the general population (Gilens and Page, 2014). So there can be overwhelming popular support for a living minimum wage and a solid majority for publicly provided universal healthcare, for example, but such policies are not enacted. After describing the simple supply and demand model on which economism depends, Kwak shows how it was seized upon by interest groups – namely many wealthy individuals and the business community – in their project to roll back the size and reach of government. Economism provides pseudoscientific arguments for 'free markets', and against redistributive taxation and the regulation of business. This right-wing project had important academic collaborators who helped to spread the gospel to the general public. Kwak singles out the Austrians, von Mieses and Hayek, and Milton Friedman and some of his University of Chicago colleagues. He should have included James Buchanan, the subject of Nancy Maclean's brilliant new book Democracy in Chains (2017), but (in his defence) he is not attempting a full intellectual history of the spread of economism. Wealthy industrialists established and funded right-wing 'think tanks', many of which adopted the rhetoric of economism. Universities are complicit in allowing themselves to be used as bases for 'research institutes' that churn out free market 'studies' . Law schools were a particular target for penetration. Meanwhile, the general public has been propagandized by people and organizations Kwak labels 'promoters', whose views are found in magazines, the opinion pages of newspapers, and in the school system. Most of the book is devoted to showing the defects of economism's simplistic application to complex public policy questions. Separate chapters deal with aspects of taxation, health care, labour market policy, financial market regulation, and international trade policy. In short, a great book, unmasking an important aspect of the systematic propaganda that pollutes public discourse in many countries. Gilens, Martin and Benjamin I. Page (2014) "Testing Theories of American Politics: Elites, Interest Groups, and Average Citizens", Perspectives on Politics, 12 (3 ) September, 564-581. MacLean, Nancy (2017) Democracy In Chains: The Deep History of the Radical Right's Stealth Plan for America. New York: Viking. Page, Benjamin I., Larry M. Bartels, and Jason Seawright (2013) "Democracy and the Policy Preferences of Wealthy Americans", Perspectives on Politics, 11 (1) March, 51-73. Thanks to M Gaffney, an "original neoclassicist" I have become aware that a really major sabotage of political economy studies was done by one person in particular, JB Clar, who worked tirelessly to expunge from neoclassical models the notion of "land", inherited from the classical political economists, by confusing into a general notion of "capitalness". As M Gaffney documents, this was done for purely political reasons, to eliminate from Economics the notion of "land rent" and thus foil the arguments of Henry George and others. Mason Gaffney amusingly makes this criticism from an "orthodox" point of view, as his argument is that "orthodox" neoclassical theory has always treated "land" explicitly, and the work of JB Clark has been a betrayal of "orthodox" Economics to dissemble the exploitation of capitalists by landowners. Thank you for that comment. By coincidence, I recently read some short essays along these lines, one of which referred to Gaffney. This Evonomics site has many interesting essays.